Braylon Edwards jumped into the elite ranks of NFL wide receivers in 2007. The Cleveland Browns WR caught 80 balls for over 1,200 yards and 16 touchdowns last year. 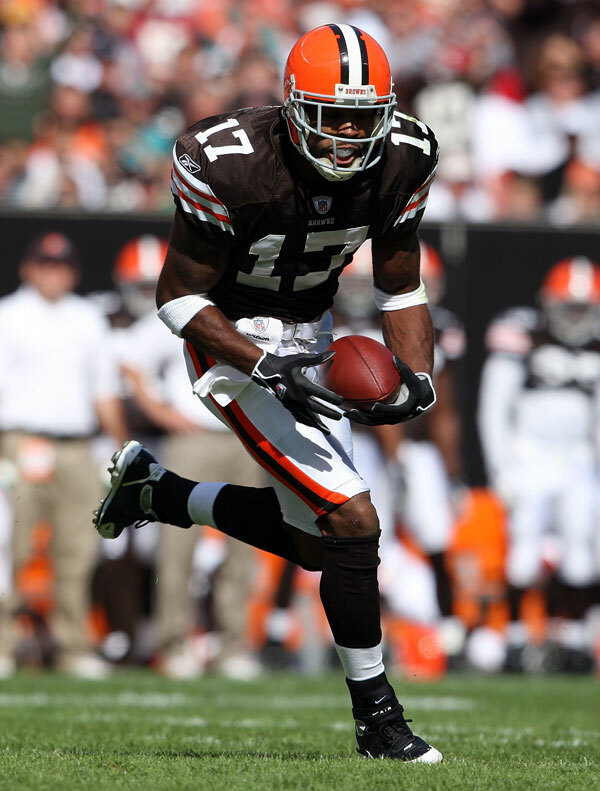 Braylon Edwards, himself the son of former NFL wide receiver Stan Edwards ( Houston Oilers, Detroit Lions), was a major reason for the Cleveland Browns offensive explosion. 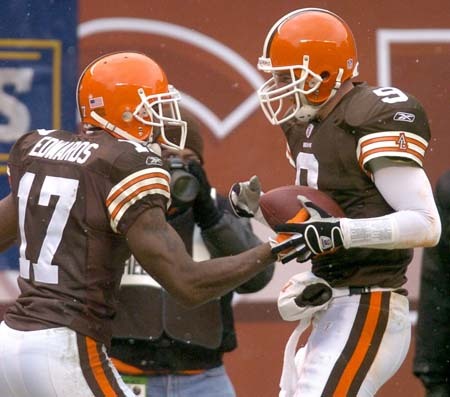 Edwards had shown flashes why he was the 3rd overall selection in the NFL Draft in 2004, but had yet to put together a full stellar season until 2007. Braylon Edwards is the big play threat on the offense, giving Derek Anderson a target who can go the distance anytime he touches the ball. (16 out or 80 equals a touchdown 1 out of every 5 catches, for those who can’t do the math in their head.) That’s huge production for a fantasy wide receiver, especially one that was being drafted in the 6th round or later in most 2007 drafts. Fantasy teams won’t be so lucky this year. Braylon Edwards is likely to be going in the 2nd round much of the time. Suddenly, the Cleveland Browns have one of the most intriguing offenses in pro football. Their offensive line is young and improving. The Browns have two exciting young quarterback options. Kellen Winslow, Donte Stallworth and Jamal Lewis offer enough viable weapons that defenses can’t focus on one player, while Braylon Edwards is a fantasy stud. If you get late in the 2nd round, take Braylon Edwards and expect to have a young receiver in the prime of his career. If Edwards somehow slips into the third, grab him without hesitation. What a difference a year makes. Look what I wrote last year for Braylon Edwards and you’ll see this guy has come full circle in only a year. A year ago in 2008, Braylon Edwards was a 25 year old wideout coming off a season with one of the NFL’s most improved offenses and had made a name for himself not only with big plays, but also spectacular highlight receptions. In 2009, Braylon Edwards is coming off a season where his production was way down and his drops had the Cleveland Browns on the verge of trading him. Meanwhile, you have Eric Mangini coming into the Cleveland Browns, pretending to be the next Bill Belichick. He’s shipped off Kellen Winslow and seemed ready to ship off Brady Quinn and/or Derrick Anderson for a quarterback, because he’s looking for a winning attitude. This has the makings of a toxic locker room. New York Jets fans criticized Eric Mangini for being too conservative of a play caller. Now he’s calling plays for a team with an aging running back and without any other star receiving threats, but I bet he wants to "spread the ball around" and slow down the game. In other words, Eric Mangini will attempt to be everything his mentor, Belichick, isn’t these days – and still pretend he’s the second coming. So Braylon Edwards comes into 2009 looking like a major risk to be in a conservative offense where the coach wants to ship him out. I’m wondering when NFL teams are going to realize that Bill Belichick assistant coaches aren’t Bill Belichick – they seem to learn all the wrong lessons from the man. Well, either that, or they aren’t lucky enough to be coaching Tom Brady. Either way, I thought Braylon Edwards and Brady Quinn were going to be the NFL’s next good young QB-WR combo. Now I’m reduced to saying you should draft Braylon Edwards as a young wide receiver coming into his prime years, but only in the 6th or 7th rounds, when less talented receivers are already off the board. Braylon Edwards finally "broke out" last year. Averaging a touchdown per game is huge in fantasy football, especially for a receiver, because the fantasy owner can more or less depend on big production from the player week in and week out. Braylon Edwards went from a 7th or 8th round wish to a possible 2nd rounder this year. Derek Anderson and Braylon Edwards — as strange as it would have been to say a year ago this time — is one of the biggest combos in fantasy football coming into 2008. Anderson has a big arm, while Edwards has the speed and size to pull down the deep balls. This year, Donte Stallworth will line up on the other side of the field (at least as long as he’s healthy). That gives the Cleveland Browns another deep threat, and there’s talk that the Browns are drawing up plays to take advantage of Stallworth’s speed. How that affects Braylon Edwards’ deep play potential is anybody’s guess, but I’m assuming not much. This is the kind of stuff every team says in the offseason, and then the stars are the stars come Week 1. Having a proven deep threat on the other side can only help Braylon Edwards, in my mind. This means that opponents might need to leave Edwards in single coverage a few plays extra a game, so he should have a few more opportunities to get open. However many times they target Stallworth, I’m guessing Derek Anderson will find Braylon Edwards open deep (or short) just as many extra times. Braylon Edwards is coming into his prime years and the NFL better watch out. Edwards is the type who might be a Top 3 receiver next year, so you can still draft this kid high and hope he’s still a little underrated. There are two things to remember. One, Braylon Edwards fought through some injuries before in years previous to 2007. So the jury is still out on his long term health status, though there’s little to convince me that he’s an injury risk. Maybe the Browns’ awful luck in that arena is finally over with. Two, touchdowns are hard to predict. That is, you see a few players every year jump up and score a bunch of touchdowns, then never reach that level again. It will be hard for Braylon Edwards to score 16 touchdowns again. That takes a lot of talent and a fair amount of luck. So if you’re drafting Braylon Edwards and pencilling in sixteen T.D.’s, you might be disappointed. The good thing is, you’re going to have to be happy with something closer to 12.